Are you looking for an alternative afternoon tea spot in the North East? Then the American Sharing Tower at the Hilton Garden Inn, Sunderland could be for you! Situated in the Karbon Grill part of the hotel, opposite the Stadium of Light, on Vaux Brewery Way, it is easy to find with plenty of parking (providing its not a match or concert day!). You’ll find a tasty array of American classics served traditionally on a three tier cake stand. I like that there is more of a focus on the savoury selection rather than the desserts, in a similar that a Gentleman’s Afternoon tea does as I do have more of a savoury tooth. Gracing the top tier, you’ll find a pork and chorizo slider which is a mini burger made up of a lightly toasted bun, succulent meat and melting cheese with crisp salad. I found the mini slider to be absolutely delicious, one of my favourites and just enough to eat. I never choose a burger when we go out to dinner as I find them to be far too heavy and have too much bread whereas having a miniature version is the perfect size. There’s also a buffalo chicken wing with hot sauce which was another of my favourites. I love hot and spicy food so this suited me down to the ground. On the middle tier, there was mini calzones (one cheese focused and the other pepperoni) and a cheese and pickle bite with sauce for dipping. In all honesty, I could take or leave this selection as, although there wasn’t anything wrong the items as such, they didn’t taste particularly special. I really think that Karbon Grill could have come up with something that felt much more American than these two both to the taste and aesthetically. While they tasted nice, they look like something that I could pick up in the party food selection at my local supermarket for far less than the £14.50 per head that this Afternoon Tea costs. The bottom tier of desserts did make up for the middle row with a mini key lime pie which had just the right amount of zesty sharp flavour to it, a slice of pecan tart which was deliciously sweet and a slice of Mississippi mud cake that would send a chocolate lover to heaven! A choice of tea or coffee was served along with a mini strawberry and banana milkshake which all honesty, didn’t taste like a milkshake. When I think of an American milkshake, I think of something so sugary sweet with ice cream in it whereas this was more like a smoothie. It tasted very yoghurt based and packed full of strawberries which tasted far healthier than the American style milkshake that I had envisaged. I really enjoyed it and would prefer it to a sugary sweet milkshake any day however I didn’t think that it was suited to this particular menu- the traditional, ice cream sweet strawberry milkshake would have suited the sharing tower more, regardless of which I’d prefer personally. Since it was more of a smoothie, it felt more like a breakfast drink; deliciously thick and fruity but a little misplaced in my opinion. Overall, I do think that the American Sharing Tower is a fun alternative to a traditional afternoon tea and would be great to enjoy in place of afternoon tea, or you could order a few between a group of you to snack on while you enjoy a drink at the bar inside the hotel. I particularly think that it would be ideal for teens who don’t want to opt for a classic afternoon tea but who still want to share the experience. At £14.50 a head, it is a lot cheaper than many afternoon tea style menus out there but because of the middle tier not quite hitting the spot, I do think that it is quite expensive for what it is. If they were to change the selection in the middle to something that had a little more about it then I’d definitely think that it would be good value for money as a treat, especially for a birthday or celebration! 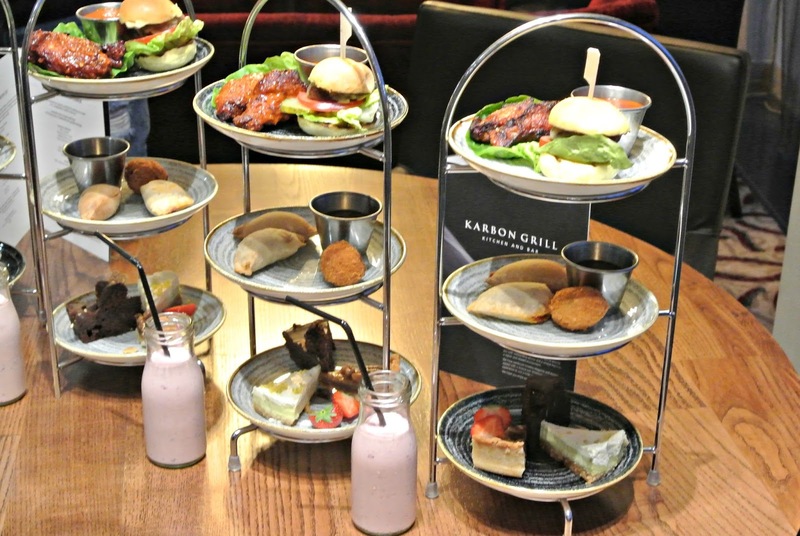 You can book in for the American Sharing Tower at Karbon Grill by calling 0191 349 8500 and you can check out their menu here. Previous Post Degustabox Subscription Service For Foodies PLUS Discount Code! Oh wow I really love ths! Very great options for a tea time. And nice price too. Whjat a wonderful place to eat at! The buffalo chicken wings with hot sauce looks amazing! YUM! All the food looks delicious and the deserts look and sounds amazing! This looks so awesome and way better than a normal afternoon tea!! This is amazing! What a twist on Afternoon Tea. I think I would prefer a traditional, but if there's a veggie option of this, then I'd be more than willing to try.